Happy 2011! I know it's been a while since I blogged (3 weeks to be exact) but I've been busy with my trip to Maldives, juggling my home renovation, my new job and most unfortunately, battling the flu bug for a prolonged period of time. 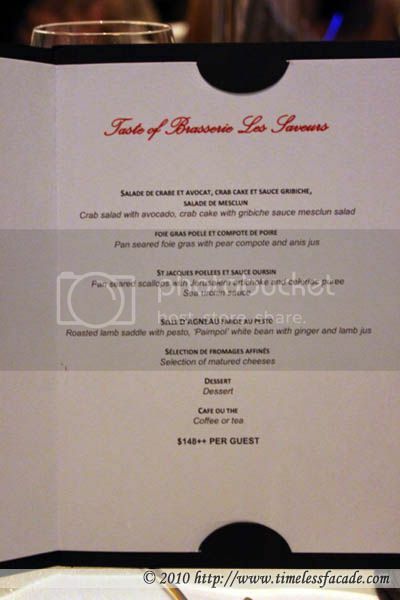 Looking back on 2010, it's been a great year and what better way to start off 2011 than a dinner with a couple of food buddies at Les Saveurs? Please allow me to apologise in advance for the onslaught of poor quality photographs as I got my settings all screwed up, aided no less by a polarising filter which I stupidly forgot to remove. 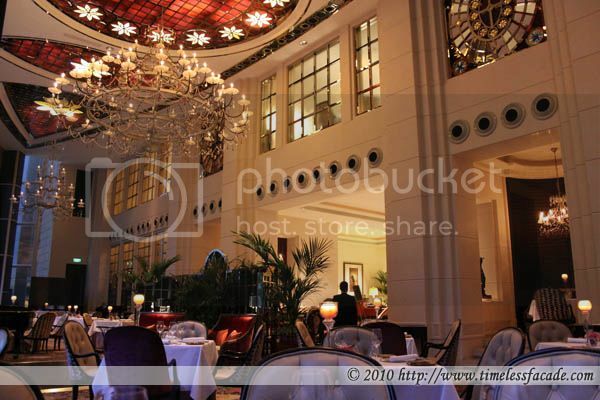 Les Saveurs has an air of posh elegance to it, basking in the evening glow from the Victorian styled chandeliers. I still prefer the look in the day though, with natural sunlight flushing through the towering windows. Rather interesting taste - Rock melon with a spicy aftertaste. Not too sure I'm a fan of it though. Honestly I don't remember much about this except for the fact that I constantly plied my complimentary bread with the salmon rillette. And yes of course, the sesame coated deep fried cheese balls. I didn't find it especially enticing but apparently some folks around the table thought otherwise. 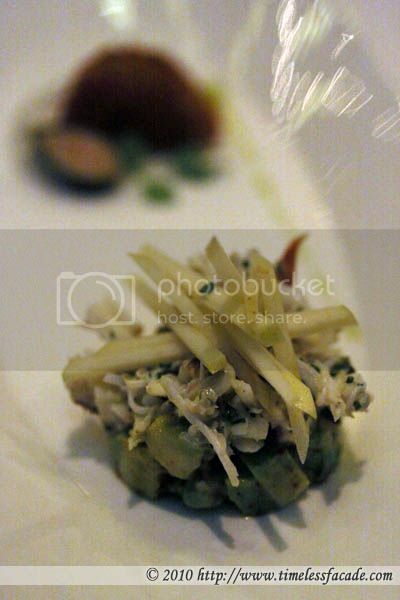 Teeming with avacado, apple strips and finely shredded morsels of crab meat, the crab salad was a joy to have. Sweet, creamy and juicy sans the fishiness. I enjoyed the crab cake as well, which was packed with crab meat and had a nice creamy tinge to it. Soft but not quivery. How disappointing. 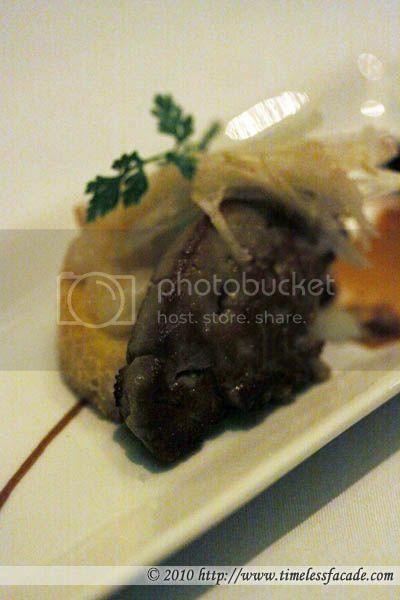 Topped with pear slices and dusted with salt granules, the liver was a tad overcooked but at least it wasn't oozing oil. Scant consolation I guess. 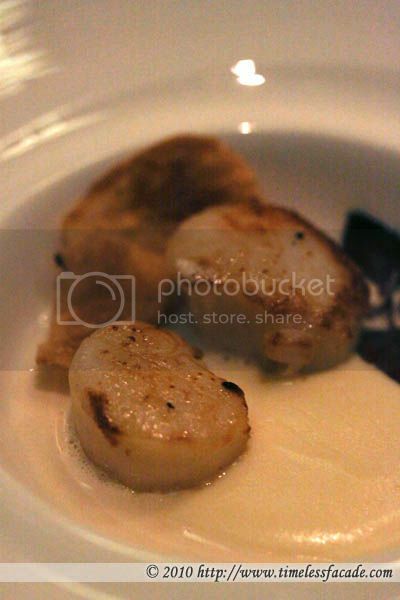 The scallops were well seared till a little charred in certain areas, giving rise to a tender yet mildly chewy texture. 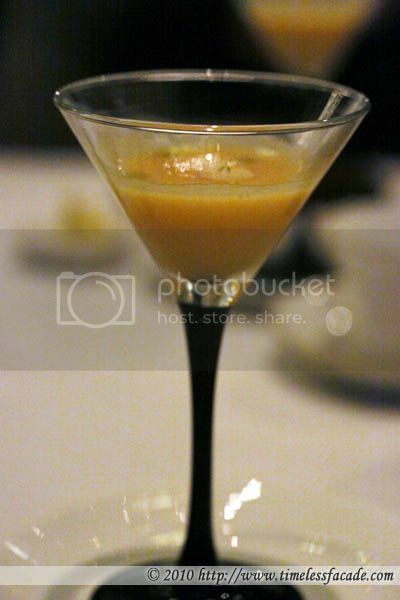 Coupled with a smooth and light sea urchin sauce, it was decent. I liked the crisp celeriac though! 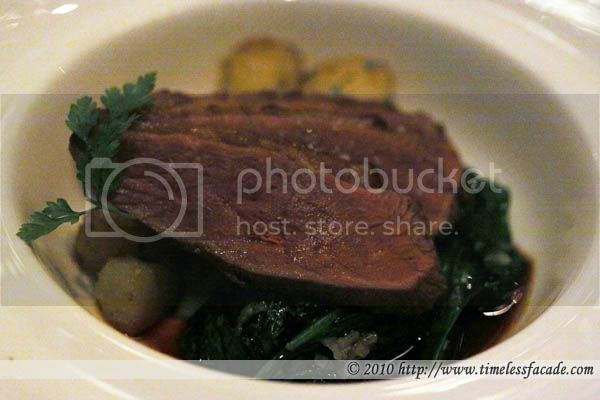 I had the lamb replaced with this dish (there was no other choice actually) and on hindsight, that was a bad move. The duck came across as way to gamy and consuming 3 thick slices of it was quite an arduous task honestly. And from what I heard, the lamb was a lot better. Bummer. 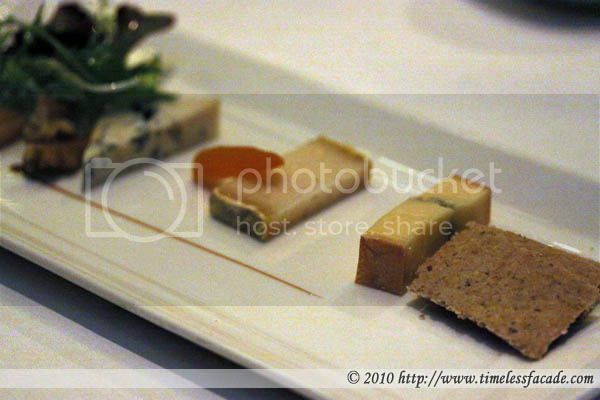 Ranging from mild to the ever pungent blue cheese. Not my cup of tea. You get a choice of the dessert of the day or anything from the dessert trolley. 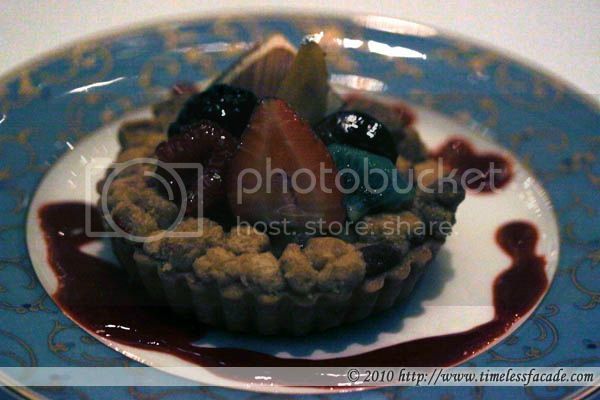 I chose the latter and with much prompting from the wait staff, went with the fruit tart. Not a bad recommendation I must say, with the tart well baked and crusty. Topped with fresh fruits, it was probably one of the best dishes that evening. 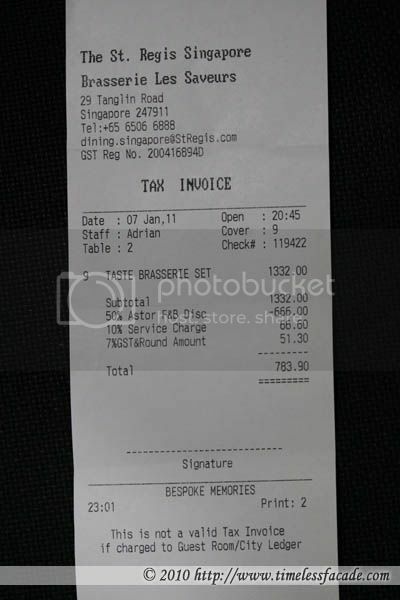 Even with a 50% discount, each of us coughed up about $87 ($174 nett) for an average dinner which had its fair share of ups and downs. To be honest, the original price point for this dinner would have been nothing short of preposterous for the quality of food. This was in stark contrast to the rather wonderful experience I had at their champagne brunch. Overall, service was decent and though the food wasn't great, all 9 of us had a smashing time (I hope!). Thanks for the support and see you folks soon! 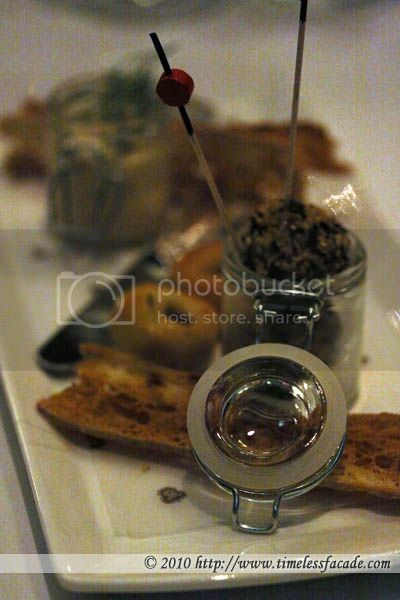 Thanks for taking the photos and inviting us to share in the chance to dine at St Regis. 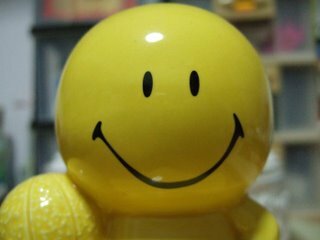 Agree with your comments on the food and service! Overall it was most enjoyable mainly due to the good company.